Banana nut bread and coffee is one of our all-time favorite, splurge worthy breakfast combinations. Right behind coffee and chocolate chip cookies! The smell of homemade banana nut bread immediately takes us back to visiting grandparents growing up. This recipe has been used for years, being passed down to each generation. With very little modifications (add chocolate chips if you have a sweet tooth) this homemade banana nut bread recipe has been made for many holidays and family gatherings. 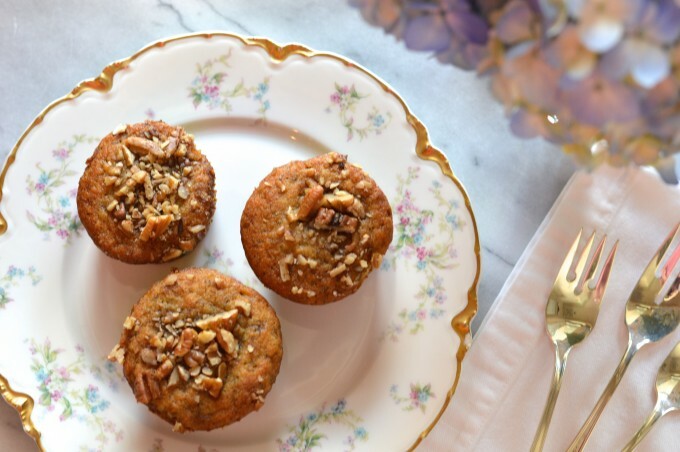 Last Saturday, before leaving for London, we decided to make a tiny change to the recipe and make banana nut muffins, instead of banana bread. The whole idea was an easy, grab and go breakfast for our husbands while we were out of town. In the hurry of baking and getting packed, we forgot to add the nuts! The batter was already in the pans, so we chopped some pecans and put them on the top. After trying one of the muffins Saturday morning, we decided this will now be our go-to way of making banana nut bread! Preheat oven to 350 degrees. Cream butter and sugar together. Add eggs, mashed bananas and vanilla. Sift together flour, soda and salt. Add to creamed mixture. Pour into greased and floured muffin tins, or use paper muffin cups. Sprinkle chopped nuts over the top of each muffin. Bake at 350 degrees for 45 minutes to an hour. Insert a toothpick into muffin to make sure the muffins are cooked enough. The muffins can be kept in the refrigerator for a week, or frozen with great results. They get even better!